You would think that after running a marathon, someone would take the month off from running? Well, any crazy runner out there (and you know who you are) will tell you no way. In fact, we are just WAITING until we can go out for that first successful post-marathon run and it’s such a test of patience. Aside from it being gorgeous out, 63 and sunny, I was itching for some speed. I set out for Central Park with no set goal, I just wanted to test out my body to see where it was post-marathon. I jumped in at 84th Street on the East Side (my local entrance) and took off. I felt great and had zero issues with any residual pain or soreness. I ran mile 1 in 5:59 and 2 in 6:16 but it felt like I was going at a slower pace. Rather than question it, I just kept going, basking in the sun. 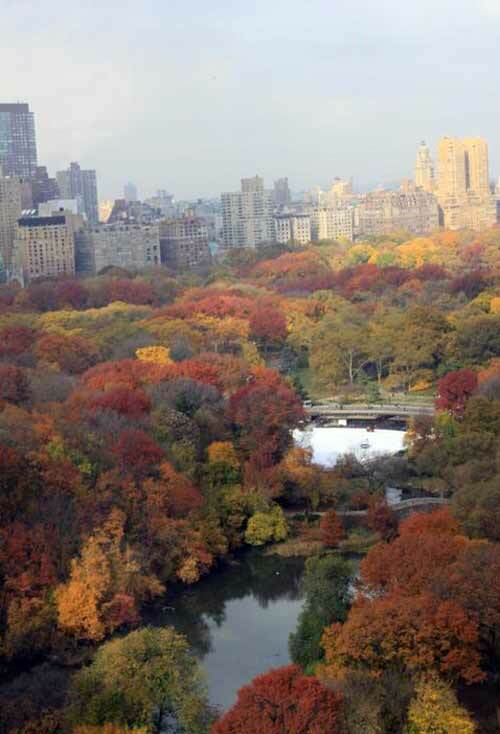 Erika took this photo from her office which I am now appropriating so you have an idea how gorgeous that Park is in the Fall. I ran 4.5 miles at a 6:09 pace and had really enjoyed myself. I think the marathon might have upped my speed? 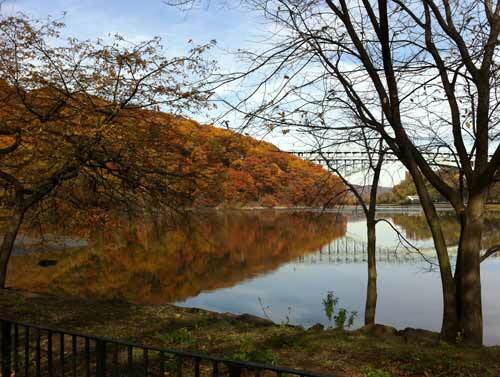 On Sunday I rode my bike up to Brandon’s apartment in Inwood. It’s 7 miles, but (for any of you who have yet to bike the northern part of the island) it has crazy hills! My legs were burning something fierce when I landed at Brandon’s. I chose to ride my track bike Athena as I had been neglecting her all season in lieu of my TT Bike. It cannot coast nor does it have brakes, so hills become quite a challenge. 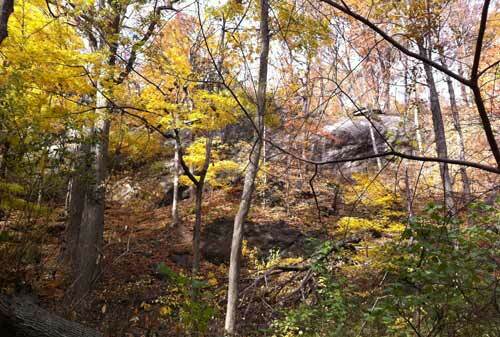 Our mission was to rock climb around Inwood Park, Manhattan’s most natural park with its untouched primordial forests. Brandon was on point for this mission since it was his neighborhood and I was new to the park. As we entered I was immediately blown away by it’s natural beauty. 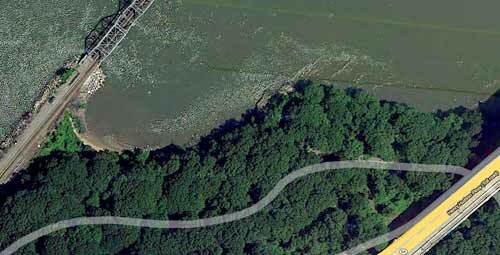 SIDENOTE: I am an avid NYC history buff (go ahead, call me nerd, I stand by my obsessions) and had always wanted to explore Inwood Park so I was ecstatic! 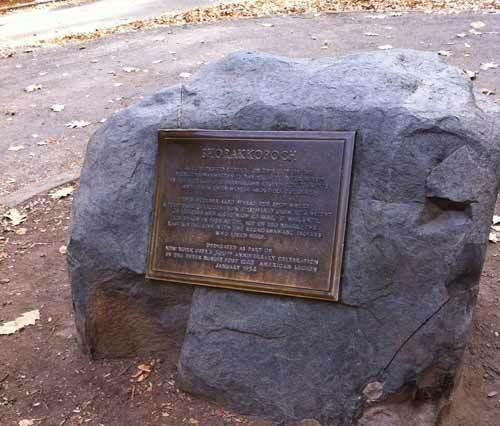 Our first stop was the famous rock where the Native Americans sold the island to Dutch settler Peter Minuit in 1626! Just so you know, that rock was not there at the time. In fact, a huge tulip tree (native to the island) was on that spot. It died in 1933 so they put the rock there in it’s place. Soon after we confronted our first set of cliffs. They were massive rock outcroppings with natural caves (that’s right, caves) where the Indian’s used to take shelter. These were no joke. We made a few attempts and got half way up before deciding we needed better gear… like rope and harnesses. Oh right, I forgot to mention we were free climbing. After ascending the cliff from it’s sides we went on to hike and explore the rest of the park. We really couldn’t have picked a better day. The leaves were a rustic array of yellow to red for as far as you could see. The highlight for me, was navigating to a small beach at the island’s most northern tip. I never thought I would ever get to this spot after seeing it n passing on an Amtrak Train, but we managed to find it. We spend around 2 hours hiking the hills and paths before heading back. I then biked the 7 miles back down to my neck of the woods which was extremely difficult as I was wiped out. I kept thinking of it as some weird Triathlon or something. Bike, Rock Climb, Hike.